Litigation: In Van Orden v. Perry, 545 U.S. 677 (2005), the Supreme Court held 5-4 (no majority opinion) that the presence of the Eagles monument on the grounds of the Texas State Capitol did not violate the Establishment Clause. In the Jefferson Madison Center’s opinion, Chief Justice Rehnquist’s plurality opinion was filled with misrepresentations (documented in Robert V. Ritter’s Supreme Scandal: The Supreme Court Blesses The Ten Commandments). In addition, it should be noted that at the trial court, attorneys for both sides (including Sen. Ted Cruz, then Texas Solicitor General) falsely stipulated that the Ten Commandments was an element of the Texas State Capitol’s designation as a National Historic Landmark. Location: Nueces County Courthouse, 901 Leopard St., Lipan St. side. Location: Fair Park, Texas State Fair, 3921 Martin Luther King Jr. Blvd. Notes: The Dallas monument is an early Eagles monument with the commandments numbered by Roman numerals. The monument is facing 23rd St. at the intersection of Broadway Ave. Location: The monument is in median of Broadway Ave. at the intersection of 23rd St.
Notes: Arie No. 48 has disbanded. The Hebrew commandments on two tablets atop the monument are unique amoung Eagles monuments. 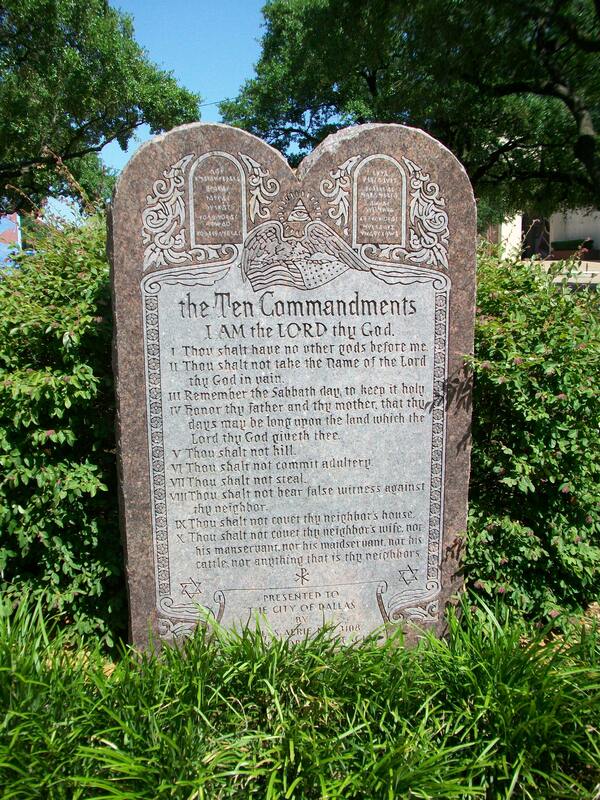 In 2010, a woman mistook her throttle for the brake and crashed into a Ten Commandments monument. The woman, 20, was uninjured in the 2:48 am Thursday, June 24, crash, according to a Galveston police report. The woman prepared to turn west on Broadway when she saw another car drive through a red traffic light, almost striking her, the report states. She “went to hit the brake, but she missed and hit the gas on accident,” the officer wrote. The car crossed the median at 23rd Street and struck the Ten Commandments. Headline writers pontificated throughout the day: “Wrong turn leads to God,” “Stray driver finds religion,” “Woman brakes Ten Commandments” and “Thou shalt not mistake the brake for the gas”. The monument itself was not damaged, but now has a slight lean to the backside. See YouTube video at https://www.youtube.com/watch?v=Y0EgQOR0QuI. Current Location: MCH Medical Center Hospital (500 W. 4th St., Odessa, Tx. ); private property. The monument cannot be seen from the street. Original Location: Ector County Courthouse.